Jeeze... I couldn't stomach that event, just the name fecked me off, 'Progressive London'.. I mean, Lib Dems and NL apparatchiks coming together....Oh, and Socialist Action (remembered some of those names from dim and distant past!). Rumour has it that Ken is going for the Labour NEC, but that just may be untrue tho' who knows. I preferred spending my time wandering around Southbank with a group of others taking pix and holding banners, while getting stopped by security guards and cops as opposed to listening to bureaucratic right-wing sell-outs! 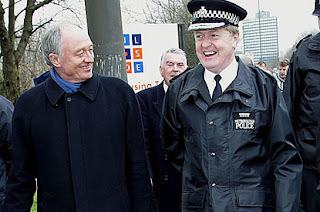 I blame the flu and the memory of the shite that Livingstone came out with over the Menezes case. Oh, and hope the flu goes and get well soon.